And that is the perfect start for Wales. The action continues with Scotland facing a tricky away trip to San Marino. No easy games and all that. Wales manager Ryan Giggs speaking to Sky Sports: "It's not easy. I tried to play it down because I knew other teams played first but you do feel the pressure. There were so many outstanding performances and we dug in at the end to get that clean sheet. "We have got a great group of older players and younger players. I wanted clean sheets. We got two clean sheets. We have got a lot of talent in the squad too so we will always create chances. "It will be a tough game next but we will prepare right. The fans are ready and confident too. It wasn't easy at the end but Ashley Williams came on to see us home and give us that experience. "It was a great game with some nice football - it's just a shame there weren't more goals but that will come." Wales midfielder Matthew Smith: "It was fantastic. We know the atmosphere here is always amazing and the fans made it special. They are a fantastic team with good individuals so we knew it would be tough. "We got that early goal to help us and then defended really well. It is quite inexperienced on paper but we know everyone can do their jobs. The old guys are great with us too. It's a great mixture in the team. "It was a big challenge for us to get the win that we did." 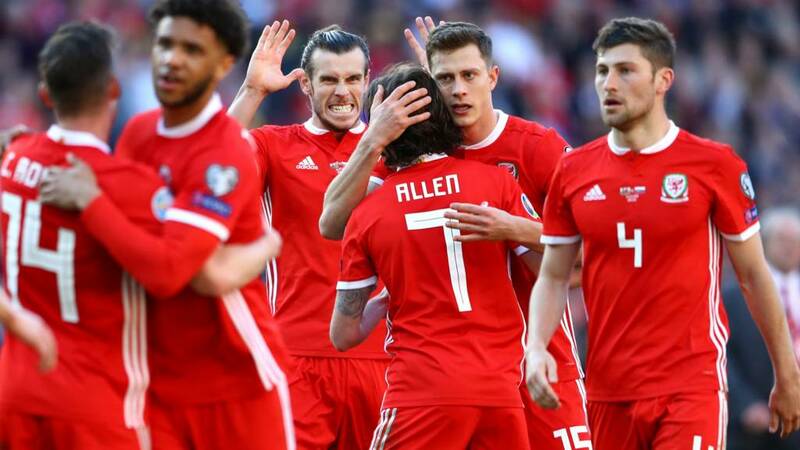 Wales have won consecutive matches in all competitions for the first time since a run of three in October 2017 under Chris Coleman. Dan James scored just five minutes into his competitive debut for Wales, with the Dragons’ earliest goal in a competitive fixture since March 2007 (Ryan Giggs vs San Marino, three minutes). Ashley Williams made his 85th appearance for Wales – only Chris Gunter (94) and Neville Southall (92) have played more games for the Dragons. Wales goalscorer Daniel James speaking to Sky Sports: "It was a good start after we got that early goal. From then on, we had to dig in. The only thing I had in my head was to shoot and luckily it went in. "In the second half they had a lot of the ball but we got the win in the end. We have had two hard games in four days so have to prepare right for them. Wales winger Gareth Bale: "Everyone put in a shift today. It's what we are used to. The minimum requirement is to put in 110% and everyone did that. "We built our success off a good solid defence. We work hard in units. We always knew we could nick a goal. In the second half we came under a lot of pressure but we started the game well, got the early goal then shut up shop and we know how to do that. "We have given the fans another win and it was a good start to the qualifying campaign. We need to keep that going." But who has particularly caught your eye? Rate the players here. Wales showing their togetherness here, skipper Gareth Bale getting the side into the huddle on the pitch and giving an after match speech to his troops. The Slovaks are incensed that the referee blows for full time and are not given a chance to take the corner. Juraj Kucka is shown a yellow card after the final whistle for taking his protestations too far. NO! Slovakia have run out of chances. Wales get the victory through Dan James' early strike. A clean sheet too and a perfect start to their Euro 2020 qualifying campaign. Miroslav Stoch shot, deflected away for a corner. One last chance for Slovakia. Marek Hamsik cross, superb goalkeeping from Wayne Hennessey to come off his line and collect the ball cleanly. A sixth Slovakia booking, this one for Miroslav Stoch for dissent. He feels a free-kick should have been given to him for a foul outside the box, but German referee Felix Zwayer disagrees. What's Ben Davies doing up there in injury-time? The Tottenham man capitalises on a loose pass but his shot from the edge of the box takes a huge deflection and goes wide. Well it was a huge deflection but the ref did not see it and awards a goal kick. Still plenty of time for Slovakia to hit back for a point. A last throw of the dice from Slovakia. Defender Peter Pekarik makes way for striker Pavol Safranko. Nervy moments for Wales at the back. Joe Allen and Ashley Williams get in each other's way for a clearance in the box, allowing Juraj Kucka to get a shot away, but it flies over. 120 seconds remaining for Wales to claim a priceless victory. Another excellent Wales showing, this time from Harry Wilson. The Derby man makes way for Will Vaulks. Another Slovakia booking, skipper Marek Hamsik tripping Tyler Roberts who was going nowhere. A silly foul to give away. Another chance for Slovakia late on. Skipper Marek Hamsik whips in a ball to the back post for Peter Pekarik, but the full-back heads into the side netting from close range.